and white drawing. The only variation was that the final one took place at night; and was shaded accordingly. And that wasn't all — it was published only once a week, so even the copying didn't have to be done very often. The only thing differentiating one episode from another was that some panels contained word balloons, always fresh, tailed to the house depicted, which ranged from irrelevant to incomprehensible. The people in the house were addressed as Bill, Sylvia, Pete and Billy Jr., but it was rarely possible to figure out which one was speaking. 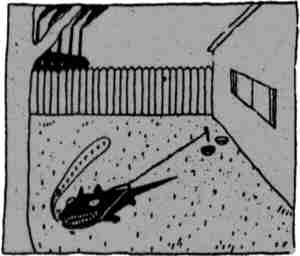 An introductory panel, always containing the same verbiage, set the stage: "The dog who is so angry he cannot move. He cannot eat. He cannot sleep. He can just barely growl. Bound so tightly with tension and anger, he approaches the state of rigor mortis." The angry dog was the brainchild of David Lynch, who conceived it in 1973 while dealing with anger issues of his own. He finally surmounted them, or at least found a way to live with them, through meditation; but his dog character never did. Lynch drew the dog in its yard, straining tightly at its chain, in 1983, and sold it to several weekly newspapers. He continued to sell that drawing, with new words attached, every week for nine years. Lynch is a film director, not a cartoonist, which may explain his minimalist approach to the drawing aspect. But many critics consider his film work an exploration of depth of meaning to be found in the word "pointless", so one never knows. He also dabbled in animation with Dumbland, which he himself called crude, stupid, violent and absurd. The latter quality is what readers generally say best describes The Angriest Dog in the World. In fact, some call it an absurdist masterpiece, while others consider it absurd to think anyone would ever bother to read it. The former apparently include editors at Dark Horse Comics (Hellboy, Little Annie Fanny), which reprinted it in the anthology Cheval Noir, starting in its July, 1991 issue. Cheval Noir ended in 1994. Tho it no longer appears regularly in print, new episodes of The Angriest Dog in the World, to the extent there have ever been such things as new ones, can be found on the Internet. Text ©2007-10 Donald D. Markstein. Art © David Lynch.